"I have been working very hard since I married to come up with a perfect potato salad. This is it - a sweet, creamy recipe made with red potatoes. Very tasty. You can substitute sweet pickle relish for the sweet pickle cubes." Bring a large pot of salted water to a boil. Add potatoes, and cook until tender but still firm, about 15 minutes. Drain, and transfer to a large bowl. Place eggs in a medium saucepan, and cover completely with cold water. Bring water to a boil. Cover, remove from heat, and let eggs stand in hot water for 10 to 12 minutes. Remove from hot water, and peel under cold, running water. Chop, and set aside. Stir the eggs, celery, green bell pepper, sweet pickle cubes, prepared mustard, mayonnaise, onion and white sugar into the potatoes. Season to taste with salt and pepper. Cover, and chill in the refrigerator for at least 3 hours before serving. Great recipe! We don't like celery or sweet pickles, so I used dill pickle relish and dill weed instead. Also added sliced black olives and green onions. Disappeared right quick, it did! This wasn't a hit with our family. 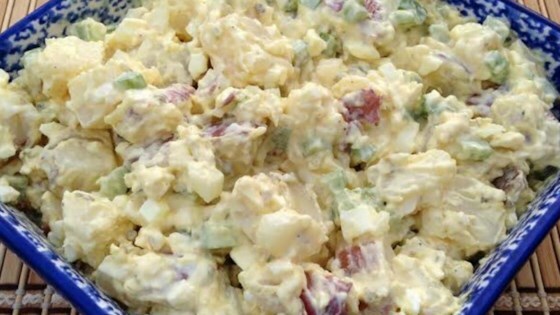 We prefer a more creamy potato salad and it had a little too much relish/pickle for our liking. I won't make it again. Excellent! Doesn't need that "teaspoon of sugar". Really delish! Too busy for potato salad! Taste was average.